North Carolina is rich in history and broad in geography, stretching from warm beachfront majesty to the base of Appalachia. That it holds a dominant place in the history of folk music is due in part to its cultural diversity, and in part to its situation midway up the coast, along the route that folk strands might have once traveled from North to South and back again. This combination of factors has made it an influential locus and crossroads for several southern folk movements of the last century, including branches of the blues, appalachian music, and strains of bluegrass, and other early rural folk forms. Rather than give the musicians and musical forms of this diverse region shorter shrift than they deserve, instead of our typical biweekly megaposts, this week we offer several shorter features on the coversongs of and from a few North Carolinan songwriters who made their mark on folk music long before the sixties transformed American folk from cultural phenomenon to a true genre. It is a tribute to their indelible influence and stellar songwriting that that these songs are still treasured in performance today. Today, we begin our journey with the songs of Elizabeth Cotten (1896? – 1987; born Carrboro, North Carolina). 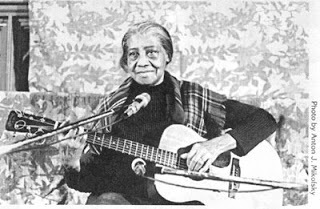 Like many early folk musicians born at the turn of the century, Elizabeth Cotten had two careers: one in her early years, as a self-taught blues folk prodigy, and one later in life, when the folk revival of the fifties and sixties drove a desperate effort to recover and record the authentic sounds of early American folk forms before they could be lost to the ages. Cotten’s story of rediscovery is especially notable for its serendipity: though a few of her songs had taken on a life of their own in the hands of other blues and folk musicians during the forties, Cotten herself had quit making music for twenty five years, only to be rediscovered in the sixties while working as a housekeeper for the Seeger family. Cotten’s strong songwriting and original upside-down “Cotten picking” guitar style, with its signature banjo-like low-string drone and alternating fingerpicking bass, would eventually result in a star turn on seminal disks and collections from the Smithsonian Folkways label, many culled from home recordings made under the reel-to-reel direction of Mike Seeger in the nineteen fifties. The support of the Seegers and others, and the subsequent success of her first album, the 1957 release Folksongs and Instrumentals, brought her onto the folk circuit, where her unique sound influenced the burgeoning folk movement, and where her songs would be heard, recorded, and passed along by the likes of Bob Dylan, Jerry Garcia, and Peter, Paul and Mary. In the end, though only four albums of her original material were ever released, Cotten remained a celebrated member of the folk touring scene into her late eighties, winning a Grammy in 1985 for Best Ethnic or Traditional Recording for Elizabeth Cotten Live! a year after being named a “living treasure” by the Smithsonian. Her music continues to be celebrated today for its timeless and distinctive qualities, and for the way it speaks to a childhood among the simple folkways of the rural North Carolina south. And her influence as a songwriter, a guitarist, and an artist echoes in the work of generations. Today, a few covers each of two of Cotten’s most familiar songs: two fragile kidfolk versions of Freight Train, which was written when Cotten was eleven, and a full set of folkvariants on the timeless Shake Sugaree, from the hearty tones of folk blues legends Chris Smither and Taj Mahal to the delicate second-wave folk field recordings of indie newcomer Laura Gibson and the previously-featured grunge-folk goddess Mary Lou Lord. As always, artist and album links above lead to the most authentic, the most honest, and the most local places to buy music: from the artists and labels themselves. The Elizabeth Cotten originals, especially, are core must-haves for any true tradfolk collector; pick up her three solo albums at Smithsonian Folkways. Assuming the weather doesn’t keep knocking out the network, stay tuned throughout the week for a short half-feature on Bluegrass legend Earl Scruggs, and a piece on the work of Doc Watson, yet another North Carolina fingerpicker. Meanwhile, I’l be sitting on the back porch, local brew in hand, watching the sun set over the sound and the North Carolina mainland, while the wild deer and the goslings root for grub in the low grass below. Y’all come back now, y’hear?